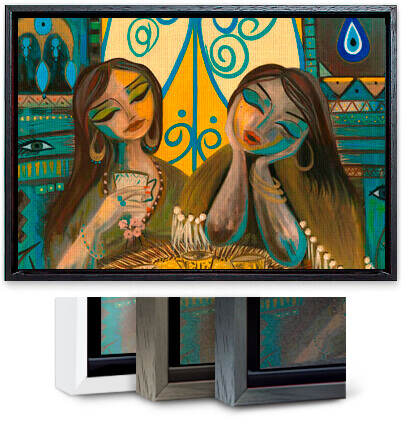 Framing your artwork with or without a mat adds the finishing touch to your work. 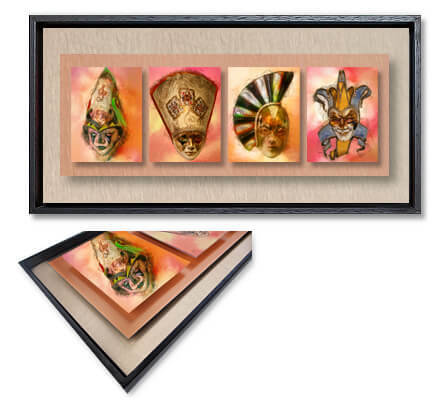 The right frame can compliment and transform any type of art for a beautiful and sophisticated presentation. 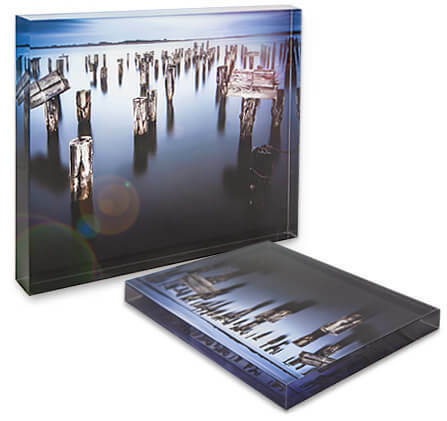 We offer some great options to showcase your work. Scroll down below to see the many framing solutions we have available. If you don’t see what you’re looking for, give us a call. We often get experimental and jump at the opportunity to create something new! We offer lots of framing and finishing options. Learn more about each. 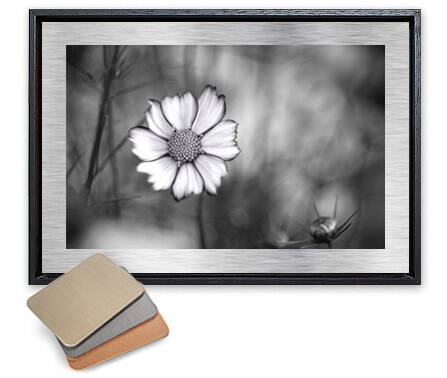 A frame with mat is a classic way of displaying an image. It is an important part of a finished presentation, especially when considering the ambiance in a space, or connecting your images to the context of a particular room. We offer many options in frames, and it’s always best to discuss these options in person. 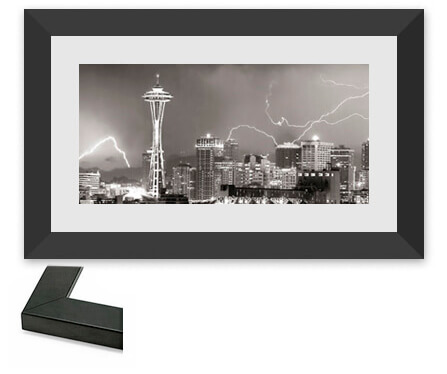 Much like a traditional frame, but with the dynamic twist of floating your canvas wrap or mounted image in the frame. The natural shadow adds unique dimension. Our Silhouette float frames are solid wood and are available in Black, Espresso & White. For even more of a contemporary appearance, an Aluminum Flush Mount carries your image cleanly in the front, with a mild accent of aluminum on the side, presented flush on a silhouette frame. 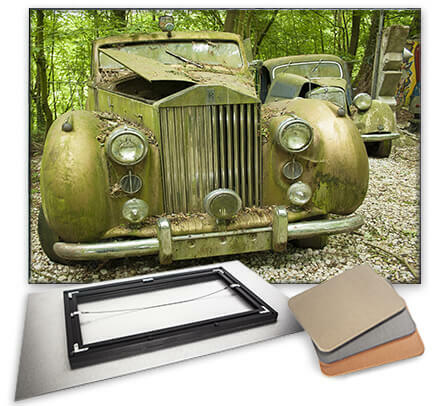 The fine art print has a special over-laminate, eliminating the need for protective glass. This particular image here is our Arches hot press smooth paper with a velvet laminate. In person, it looks like a completely unprotected smooth matte paper print. This could cause a scandal, but rest assured, it’s protected against the rogue fingerprint or splash of wine. This is a clean basic approach to displaying art. There is no dressing up of the image here. Its a 'full bleed' image on DiBond (no reveal). Its boldness is appropriate for a gallery or cafe display. As with all our DiBond and PlexiPrints, they are backed by rigid aluminum Nielsen framing, so these prints really have no size limit. This is a clever technique that takes advantage of the mounting substrate (in this case, brushed silver aluminum DiBond). The reveal is actually the raw substrate on which the image is mounted. Visually, it works much like a mat, with the added punch of dynamic, but subdued, brushed metallic glow. DiBond Metallic Reveals, such as this, work favorably for black and white photography, and high contrast imagery. The reveal can be as wide or narrow as you choose, and DiBond comes in multiple colors. 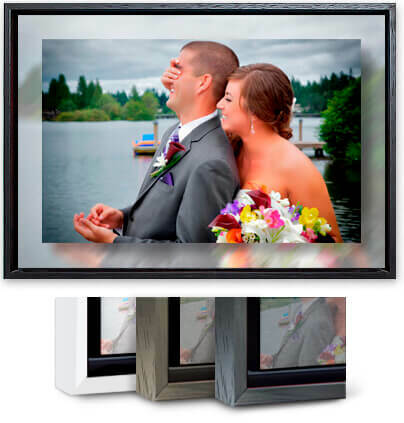 Another elegant option to the silhouette frame family is the Framed Double Float Mount, which can add visual dimension to any image. 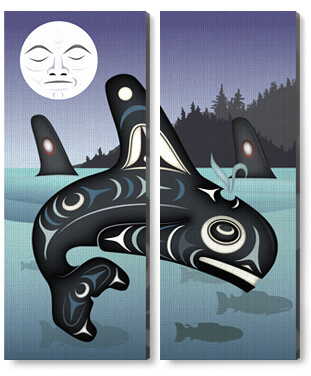 The background image is an individually stylized version of the foreground image to help ‘launch’ the front image to the viewer. It is mounted to its own substrate, then the front image (our standard PlexiPrint) is mounted over that. All of this; the silhouette frame, the repeated subtle image, the natural shadow of the front mounted image itself, creates a feast for the viewer. Available in White, Espresso & Black. Sounds like we’re talking chemistry, but the terms refer to a single image split into two or three canvases (or any mounted substrate). Generally for larger applications, this technique can command a room with its appeal. It lends a cosmopolitan flair to an image, and can create a whole new dimension to a work of art. 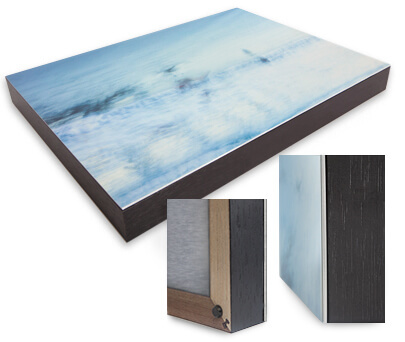 Diptychs and triptychs generally are constructed from stretched canvases, but we have created lovely displays out of Plexiprints and Flush Mounts. Also, our love of experimentation drives us to new levels every day, so don’t be afraid to ask about what we think would work! The concept of a lightbox isn’t new, but with the advent of newer, miniaturized LEDs, the lightbox isn’t so clunky any more. 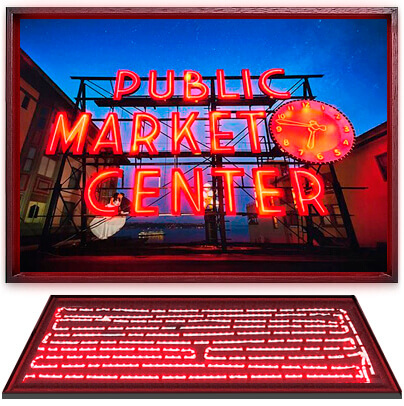 Energy-efficient and lower maintenance than their predecessor, these beauties can add a touch of customized ‘neon sign’ or cinematic interest to any space. Options vary from uniformly-lit full images, to custom masks that allow light to shine through specific spaces (see the Public Market Center image here). LED light boxes are available in most any size. A spin-off from our classic Plexiprints, these blocks are a bold statement for your image. A ‘block’ basically means the acrylic is 1” thick. This application creates a curious three-dimensional effect that definitely launches your image to a new level. Moreover, acrylic this thick tends to harness gallery light that is pointed its way, enhancing the ‘under water’ effect. Take care in ordering larger pieces though, acrylic is heavy. Available with beveled edges, or clean edges. Possibly our favorite term, ‘Experimental’ is really just a reminder that most of the pieces that leave The Color Group are in fact experimental pieces! This is not to say that you are our Guinea Pig though. Our techniques are experimental, but they are all based on -and constructed of- successful technologies and products that we have been using already for many years. We are ready to listen to your ‘crazy’ idea, and happy and willing to bring your vision to reality!